Autumn shimmer! Dress their fall table with this gorgeous, seasonal work of art! 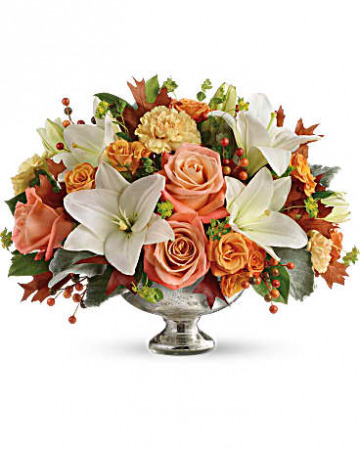 Hand-delivered in a stunning mercury glass bowl, this harmonic mix of white lilies and peach roses is sure to make their season memorable. This stunning centerpiece arrangement features peach and light orange roses, white asiatic lilies, peach carnations and orange berries and is finished with dusty miller, bupleurum and lemon leaf. Delivered in Glass bowl. As enchanting as coming across a hidden cottage in the countryside! Lush white roses and purple stock mix with delicate lavender waxflower and green pitta negra for an elegant English garden look. The decorative bouquet is finished with a pretty satin ribbon. White roses meet lavender stock and waxflower in this lush, elegant arrangement. Presented in a classic clear glass vase with purple satin ribbon. Delicate white roses enclosed in a heart made of red carnations is a promise that the departed will always be remembered with a deep and abiding love. 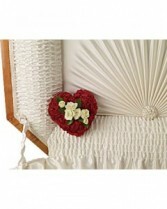 The sweet bouquet includes white spray roses surrounded by red miniature carnations formed in the shape of a heart. It's a party to go! Celebrate life's special moments with this fun, fabulous mix of roses, carnations and mums, hand-delivered in a festive, food-safe mug that will make their coffee breaks extra fun. Perfect for any festive occasion, from birthday parties to graduations to retirements! 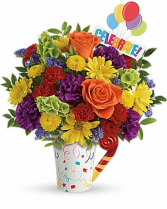 This delightful gift bursts with orange roses, purple carnations, red miniature carnations, yellow button spray chrysanthemums, yellow daisy spray chrysanthemums, bells of Ireland, blue sinuata statice, and huckleberry. Delivered in a Cheers to You mug.